The Kranji Stakes A over 1100m in Singapore on Sunday shapes up as a very competitive contest with plenty of live chances. 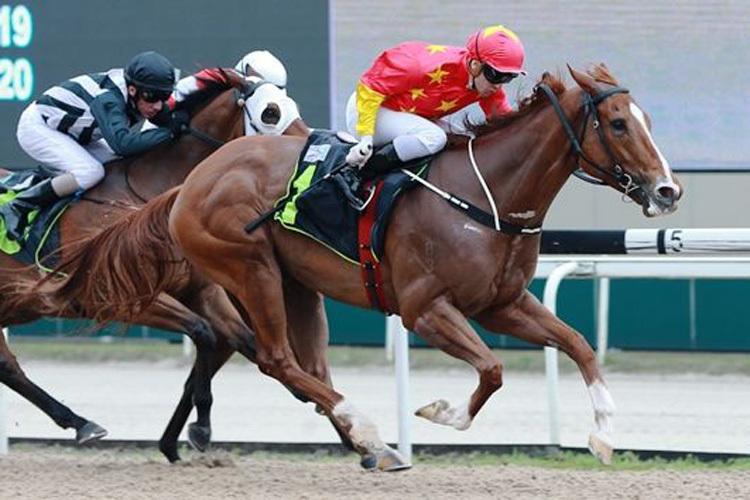 Skywalk has been one of the form horses in Singapore of late, winning a Kranji Stakes B over this C/D three back before going on to win the KRA Trophy (1200m) last start after a modest effort in the Group 1 Lion City Cup on the turf. The James Peters-trained runner has a terrific record on the polytrack, winning five of his six starts and is also undefeated from both runs over this trip. Skywalk does have to overcome the wide barrier today which he was able to do in the KRA Trophy last start, and Michael Rodd who has had the one ride for a second placing in 2016 goes back on board. Likely to try and find some cover not too far away from the speed like last start and if he runs up to his recent form he is certainly going well enough to win today. Vlad Duric who was on board Skywalk in the KRA Trophy will go back on the resuming Distinctive Darci in this race today off some strong form in group company last campaign. All nine of his career wins to this point have come on the polytrack with four of those over 5 1⁄2 f and he also tends to run well when fresh previously. Having won the Group 2 Merlion Trophy last campaign, the Mark Walker-trained runner was last seen when runner up to Jupiter Gold in a Kranji Stakes A and if he comes back in similar order he will give this a big shake today. Does have a big weight to contend with (59.5kg) from a wide draw but has trialled recently over 5 f and should be forward enough to be right in the mix. Rafaello has been knocking on the door in recent times, runner up in his last two outings, the most recent behind Skywalk in the KRA who he does meet better at the weights today. The six-year-old is another runner with good polytrack credentials, running into the placings on all four occasions although all eight of his career victories have come over the 6 f trip. Likely to not be far away in the run again today and based on what he has produced of late, including a fourth placing in the Group 1 Lion City Cup a win here is not out of the question. The lightly raced Special King is one of the more progressive runners in the field and goes up in class today off two handy wins. Got the better of Elite Power last start in a Stakes C over this C/D who runs on Friday night and all four of his wins have come over this course and distance. Does take on tougher today but has scope for improvement and has drawn nicely in barrier six.